It’s a tricky one. Which do you prefer? Smoke salmon or chocolate? Both lovely … but very different. Vass has the charm of an isolated Greek village – Rhodes arguably has more wind … or at least it arrives earlier in the day. I wont get involved in the debate – try them both I say and make up your own mind! I arrived at tea time in Vass in early June. They hadn’t had proper wind for a nearly a week – but literally as I poked my head into the glorious Cosmos Hotel, ‘Eric’ the thermal, wind, shot down the hill at 20 knots. My group were excellent and included Bernd from Germany , who was nailing duck gybes and Nik from UK who was determined to get comfortable in the straps. That’s what I love about Vass, you can have world champions and improvers all training on the same stretch of water – AND learning from each other. I’m not writing a brochure here … honesty is a virtue … and on day 5 the heavens opened in an Indian monsoon kind of way – a first for me in Vass where azure skies have always been a given. It was almost comical rain. It was also accompanied by Nature’s light show. Lightning and carbon masts aren’t happy bedfellows so we were forced top retire – not a bad thing since everyone needed a break. We assumed that would be that for the wind – but because we’d been fine citizens, we were granted a fabulous 3 hours on the last afternoon which capped off everyone’s week … followed inevitably by a proper party c/o Neilson who, as is their wont, were terrific hosts. Two days later and I’m in Rhodes. There is a happy Groundhog Day element to Rhodes. It could be just my lucky timing – but in the 7 years i’ve been running a clinic from the ProCentre in the north of the island, there has been a very simple timetable – get up, have breakfast, watch video from day before, walk to centre, have a quick simulator session to rectify issues noted on the video, check wind strength and go sailing. Normally you’d expect to plane by early afternoon – but this year we were up and riding by midday. It makes for a long sailing day since the centre doesn’t close until 7. It certainly suited Dutch Jan, arguably the most active member of all time, who in his search for the perfect gybe, regularly put in 6 water hours a day! 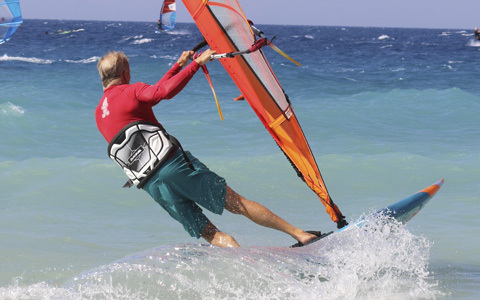 People tend to associate Rhodes windsurfing with Prassonisi in the south – it’s a great, albeit barren, spot – but this year the north got a lot more wind. Jurgen, the co-owner of ProCentre, explained there’s a local thermal caused by the heating up of Rhodes town. Hence we’d get 18 knots on days when nothing was forecast. It was a truly great, international group including a Finn, a sprinkling of Dutch, a Norwegian Israeli (that’s a first) and a few few Brits. They all got on famously. And happily there were no conflicts over the World Cup when everyone became an England supporter.